BIRDEM Hospital Dhaka contact number with some essential information is combined in this content. “Bangladesh Institute of Research & Rehabilitation in Diabetes, Endocrine and Metabolic Disorders” is known as BIRDEM Hospital Dhaka. It offers the comprehensive healthcare to the huge number of diabetes patients across the country with recognition of the unique program of BADAS. The association provides the program through its central institute named BIRDEM. It has largest turnover of the diabetes out patient in the world under a single roof with 700 beds for in patients. It comes with most of the latest discipline of the diabetes medication. Moreover, DIRDEM conducts the course of the highest number of post graduate among the private sector in Bangladesh throughout its academy. The institute is widely acclaimed as one of the worlds most advanced center for research. The world health organization (WHO) has recognized BIRDEM as a collaborating center for diabetes control, prevention and research. It’s outside of Europe with the first of kind. 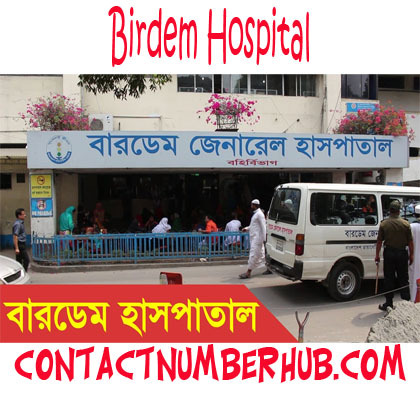 It has another wing named BIRDEM-2 that was started in February, 2012 with the facilities of Gynae and Obs, Pediatrics OPD facilities, metabolic disease, Diabetes Endocrine & GHPD, Eye, Skin care facilities for the patients of diabetic as well as the non-diabetic subjects. BIRDEM and BIRDEM-2 take care of the clinical services division about 4064 patients that come to the OPD daily. Some of the out patients services are including Pediatrics & Neonates, physiotherapy, skin diseases, dentistry, Obstetrics and gynecology, plastic surgery, orthopedics, surgery, pulmonology, endocrinology, nephrology, cardiology, gastroenterology, psychology, neurology, internal medicine etc. Some of the out patients services are including Pediatrics & Neonates, skin diseases, dentistry, Obstetrics and gynecology, plastic surgery, orthopedics, surgery, , endocrinology, nephrology, cardiology, gastroenterology, psychology, neurology, internal medicine etc. The institute also operates a Nursing College for B.Sc. in nursing course with 4 years duration. It has 24 hour patient services with 45 doctors and 300 trained nurses in the hospital. It contains 747 ward in 103 cabins. The price of the seat in a ward is BDT 850 per day where the range of the cabin is from BDT 1000 to BDT 1500. Here are the facilities of the surgical orientations, including Open heart surgery, Kidney transplantation, Bypass surgery, Uratory, lithotomic, Hematology, Valve replacement, Laparoscopy, General surgery, Gastro, stormy, Urology etc. Some of the common surgery and their expenses are as scissorian BDT.7000, Appendicitis BDT 2000-3000, Kidney stones BDT 25000-30000, Gall bladder stones BDT 15000-20000, Ulcer BDT 5000-8000 and many more.